As coastal and surface fisheries are depleted and fishers turn to the deep sea to fill their nets, scientists are developing innovative ways to locate and protect undiscovered deep-sea habitats. The deep sea: a dark, vast and remote environment 200 meters from the surface, that makes up almost two-thirds of the ocean’s habitats. 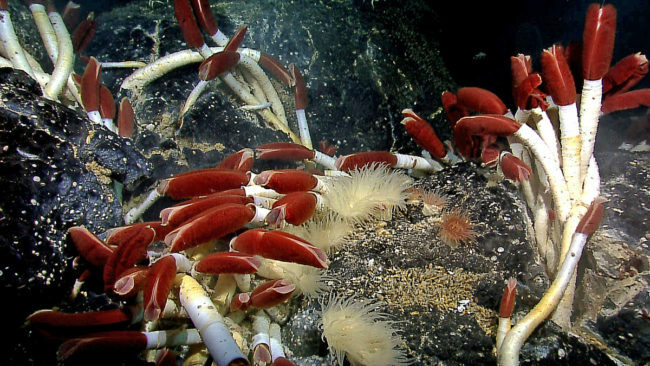 Its depths are scattered with fragile communities of highly specialized creatures like the hydrothermal-vent-dwelling tube worms pictured to the right (or below on mobile). These worms are a part of a delicate ecosystem that can withstand the toxic soup of hydrogen sulfide billowing from the vents. Complex deep-sea communities like these are hot spots of biodiversity that fuel fisheries at the surface and along the coast. Studying these isolated ecosystems is dangerous and costly, which means many of their inner workings remain mysterious to scientists. Nonetheless, commercial exploitation of deep-sea species is accelerating. With coastal and shelf fisheries dwindling over the last few decades, the fishing industry is turning to the deep sea as the last frontier. Deep-sea fishing practices can be incredibly destructive. Bottom trawling, the practice of dragging nets, chains and other heavy equipment over the sea floor, is a prime example. This practice and others can inflict irreversible damage to deep-sea ecosystems by removing nearly all of the organisms and decimating structures they live in. Other habitats might bounce back, but deep-sea species are uniquely vulnerable. Since the environment is so dark and cold, metabolisms are slower. Many species have long lifespans and slow growth rates, which means they produce fewer offspring less often than is common throughout the ocean. Logically, many deep-sea communities have low productivity and are more susceptible to threats of overfishing, pollution, coastal development, invasive species and climate change. As coastal and surface fisheries are depleted and fishers worldwide turn to the deep sea to fill their nets, there is a greater need for effective conservation planning that can preserve fragile deep-sea ecosystems. To this end, a number of scientists and conservationists have been working on innovative ways to locate and protect unknown deep-sea habitats. By using species distribution models (SDMs), or computer algorithms that can predict and analyze the distribution of species in space and time, scientists can identify where undiscovered deep-sea habitats might exist around the globe. Scientists use what they already know about species occurrence/abundance (i.e. where they prefer to live or are most likely to be found) and existing data about the surrounding environment to create maps of where deep-sea species could potentially live. These maps can be used to inform the decisions of policy makers (for example, in the planning of marine protected areas). 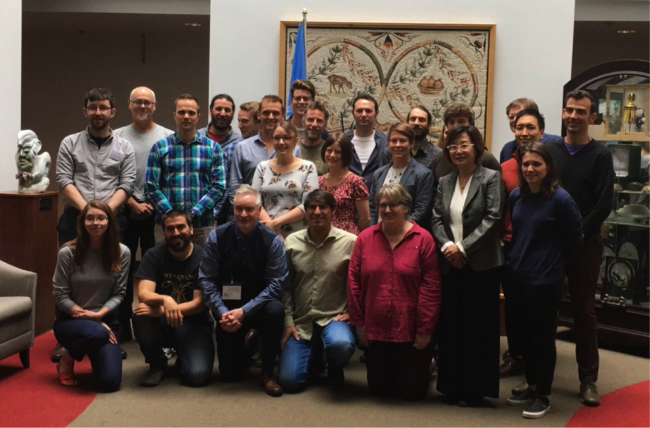 I recently attended a workshop hosted by the Convention on Biological Diversity (a treaty for promoting the conservation and sustainable use of biological diversity); where global SDM experts and deep-sea biologists gathered to discuss appropriate data and methods for modeling deep-sea habitats. The workshop brought together the biological and environmental datasets relevant to deep-sea species from ATLAS (a project aiming to better understand complex deep-sea ecosystems) and SponGES (a research project trying to develop an ecosystem-based approach to preserve deep-sea sponge ecosystems) and showcased the latest SDM approaches in the context of data-limited deep-sea environment. These interdisciplinary workshops can be an extremely valuable learning experience for scientists. Many strive to make the outcomes as ‘realistic’ as possible only to realize how difficult it is to translate the results into scientific advice that can be used for management. For example, after spending many hours staring at monitors and thinking about SDMs, I was stumped and silent for a solid 10 seconds when a fisherman asked me to define what a “model” is. 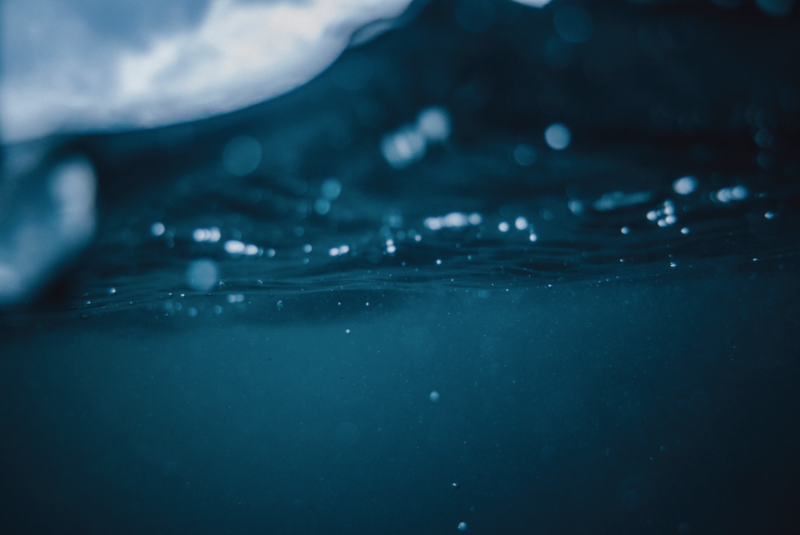 By bringing together big datasets and the diverse scientists responsible for them, these workshops can establish effective collaborations within the deep-sea modeling community. These collaborations lead to more robust SDMs capable of identifying ecologically important deep-sea areas in need of protection.